We are looking for the real sportsman. This is the game specially for you. 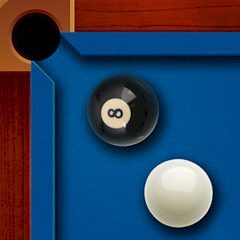 Just play the real pool and become the winner of the game. Are you ready for such a challenging game? Then do not waste your time and set the best record. Enjoy it. Do you like pool? Then this game is for you! Just play with friends and enemies alike! You have a great chance to become the best player in the whole world. Using realistic physics control the ball to take risky shots and eliminate your opponent. Just compete against opponents all over the globe and work towards being the best in practice mode. Get rewarded for your greatness with in-game pool coins and customize your cue, table and other items. Challenge yourself to level up to the top of the world and set the best record here. Be sure that you will do it.